Arnold Schwarzenegger has been named Renewable Energy Leader of the Decade by the American Council on Renewable Energy, as part of its 10 year anniversary. 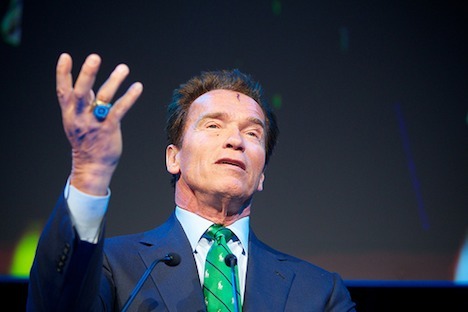 In a keynote speech at the awards ceremony, Schwarzenegger urged Republican presidential candidates to do more in the line of renewable energy investments, and pledging to be a “cheerleader” on the issue. He also noted that the United States has lost its way in the field of clean energy development. In his speech, the former ‘governator’ noted that support for renewable energy today is considerably lower than the level of support for other fuel sources at the beginning of the last century. Even today, in the year 2011, subsidies for fossil fuels are five times greater than renewable energy subsidies. Government “should never pick winners,” he argued, a clever twist on the argument Republicans have made in response to loan guarantees the Obama administration awarded to companies such as Solyndra, who went bankrupt soon after. After leaving the governor’s chair, Schwarzenegger has been pretty silent on the Republican presidential nomination race, but said he would continue to speak on behalf of green issues. Do you think the governator a worthy recipient of this award?